If you’re hard at work like most of us the year round, the chance for a holiday is the perfect time to catch up on missed opportunities with every member of the family, even the four-legged ones. Spending quality time with your pets is a must for their emotional health. These days there are dog friendly cafés and restaurants, hotels and babysitting services, even attractions that are perfect for you and your panting companion. If you’ve ever been turned away from accommodation for having the dog with you or you’re keen to learn about some great activities available for you and your dog to share in, this list is for you. Let’s begin with some of the great restaurants and cafés right across Sydney that welcome dogs of all shapes and sizes. Sometimes you just want to pop into a place for a coffee or a bite whilst on a long walk, right? These places provide you and your pooch with everything you’ll need for a memorable pit stop on holiday. Café Bones in Leichhardt first opened their doors in the year 2000 and quickly brought dog friendly dining to a whole new level. The trendy little coffee shop takes pride in offering both dogs and their owners the opportunity to eat, drink and relax side-by-side in attractive surrounds. Café Bones’ philosophy was to open a café that allowed both people and pets to interact and enjoy one another’s company in a peaceful and welcoming environment. The café, as well as others across Sydney has gone from strength to strength, now offering the world’s first café-style beverage for dogs – the Pupaccino. Sometimes you just want to pick up every member of the family and take off for a great trip away, right? Unfortunately, if you want to take your dog with you, you’ll be pretty limited to where you can stay. Luckily there are now a number of great dog friendly accommodations that welcome every member of your family, no matter how furry they may be. While there are a number of accommodations across Australia that have provisions for pets, the Observatory Hotel on Kent Street next to the historic Rocks allows guests to have a pet under 20kgs to accompany them in their rooms. Located in the heart of Sydney, the Observatory Hotel is a great place to base your exploration of the city and surrounding attractions. 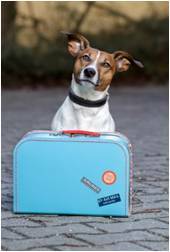 Your dog will have the opportunity to go wherever you go, just so long as you keep them clear of the hotel’s dining hall and restaurant. Believe it or not, there are dog friendly attractions beginning to pop up all over the place. The tourist industry is beginning to understand that when we take our chance for a break away, taking the dog, for many of us, is the best option. Gourmet Pawprints in Melbourne offers food and wine experiences throughout Victoria for those wanting to explore the state’s wonderful culinary offerings. Gourmet Pawprints offers events in Victoria’s wine growing regions as well as in Melbourne. 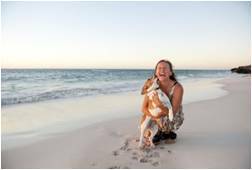 The company’s aim was to allow dog lovers the chance to experience great holiday activities together, with their pooch, rather than excluding them altogether from the adventure. Events will take you and your dog to places like the Yarra Valley, the St Kilda sands and Daylesford to name just a few. If you’ve ever wanted to go shopping with the dog, now’s your chance! Sydney’s Paddington sports some of the best specialist pet boutiques in the country and they’re worth checking out when you’re in town. Paddo Pets is a great little shop on Regent Street that offers all kinds of pet services. Grooming services and a puppy school are just some of the things this place offers; specialty dog food and pet minding services are the icing on the cake. Definitely worth a look when you’re in the city. Looking for a treat? Rupert & Dora is a great little shop that sells treats and supplements for both cats and dogs that they claim are good enough for human consumption. Australia is known for its wonderfully pristine beaches. Some of the best can be found around Sydney and what’s better still is that a number of them allow dogs to stretch their legs and get a swim in too. Rowland Reserve at Bayview is a great place to spend the day by the water and meet other dogs and owners as well. The place is beautiful and very popular—perfect for socialising your dog while spending the day on the sand. There are plenty of grassy areas and shade, as well as heaps of sand and water for the more adventurous dog. And with one hour free parking thrown in, Rowland Reserve is a great seaside spot to explore. Sirius Cove in Mosman is another great spot to take your dog for a run and paddle. The small harbour-side beach is connected to a lovely park with shade and play equipment for the kids. If you’re after other dogs to socialise with, there are usually a handful of playful pups running up and down the beach. Kurnell’s Silver Beach, on the peninsula overlooking Botany Bay, offers another fantastic opportunity for dog friendly beach days. The beach is usually nice and quiet and the water is often still, making for stress-free swimming. It’s your break away and there’s no better way to relax than to go for a day spa. There are a number of great spa places all over Sydney and if you’ve got the dog with you, why not treat them to the same treatment? Sydney offers countless high-quality pet salons where your dog or cat can be pampered and groomed beyond what you thought possible. Some great options include For Dog’s Sake in Chippendale, Secret Dog’s Business in Willoughby and Dogs @ Play in Surrey Hills. Sydney has some beautiful off-leash areas for you and your dog to explore. Centennial Park boasts one of the biggest off-leash areas in the whole of Sydney, while Bicentennial Park offers you the chance to experience natural wetlands. Other great dog friendly parks across Sydney include Sydney Park in St Peters and Rushcutters Bay Park at Darling Point; a very popular recreational space and a great spot to socialise your pooch. There are some pretty unique dog-focussed attractions that occur in Australia. Some are outrageously fun and others are really interesting to go and witness. The Royal Easter Show is held each year in Sydney in March. The Royal Easter Show has a rich tradition in bringing together rural and urban Australians for an event that showcases the country’s livestock and vegetable produce, along with other great iconic attractions. The Royal Easter Show doesn’t only hold competitions for livestock, woodcutting and cakes; there are also a number of competitions for many classes of dogs, cats and all manner of animal. The Sydney Gay and Lesbian Mardi Gras has held entertaining dog competitions in the past and the Sydney Dog Lovers Show attracts many thousands of fans each year. Keep an eye out for information on these and more in 2015. For obvious reasons most national parks across the country don’t allow cats or dogs. What many people don’t know is that it’s not the case with all state parks. It’s still possible to take the dog camping, all while ensuring that our native flora and fauna aren’t negatively affected. Some of the state parks in that are dog friendly in NSW include Copeton Waters, Lake Burrendong, Wyangala Waters and Grabine Lakeside. Introduce your pup to the wonders of the real great outdoors. Relax – it’s not as bad as it sounds. By summer school I mean your holiday period is a great time to enrol your dog into obedience training or puppy school. Obedience training isn’t the chore it sounds and, if you’re thinking of taking advantage of all the other great activities we’ve covered in this article, you’ll need a well behaved pooch. Obedience school can be a lot of fun for the both of you, especially when things start to go right and you both begin to achieve. There are great obedience schools all across Australia. Call around and ask about holiday specials and short courses perfect for your break from work. Puppy schools are also great places for you and your dog to meet both dogs and people and make friends. When is the best time to get pet insurance? Dr. Katrina Warren - When is the best time to get pet insurance? Dr. Katrina Warren shares her view when it's best to get pet insurance. Cover your pet for unexpected issues. Planning a trip without your pup? 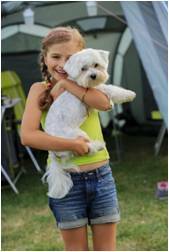 Finding the right boarding option for you and your pet. Our favourite products to keep your pooch cozy & warm this winter. Our guide to throwing the perfect puppy party!